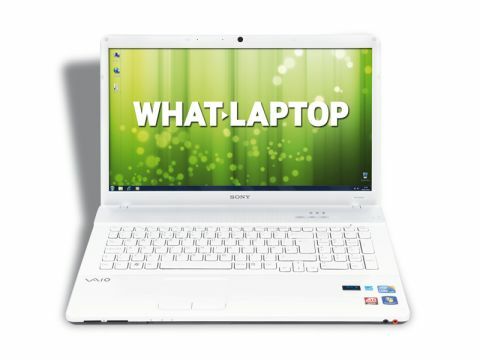 Sony's VAIO E-Series launched earlier in the year and yet it's already received a small refresh. The VAIO VPC-EC2SOE/ WI is the result and proves itself to be a fantastic all-round laptop. The combination of size, weight and average battery life means portability is limited to very short trips. Basically, this is a laptop you'll be using around the house. That shouldn't be a problem, however, as the laptop is very much designed as a desktop replacement system. With that in mind, it's designed to deal with all the tasks a desktop PC can and, for the most part, it proves impressively capable. The powerful Intel Core i5 430M processor is combined with 6144MB of DDR3 memory and during benchmarking we found the Sony to be only slightly less powerful than the Core i7-powered Mesh Edge DX11-R.
As a result, you'll be able to edit your home videos and photos with ease, as well as record and play music. To keep costs down, a mid-range ATi Radeon HD 5470 graphics card is included, and it can't compete with the likes of the Mesh or Samsung R780 in the graphical power stakes. The latest games will run, but you'll have to turn down the graphics settings somewhat for them to run smoothly. The 500GB hard drive provides more than enough storage for a whole family's data, while the writable Blu-ray drive provides a second back-up option and, of course, you can watch HD films on it. As you would expect from Sony, the 17.3-inch, 1600 x 900-pixel resolution screen impresses. Yet despite the crisp colours and detailed images, we prefer the excellent offering from Mesh, so you've got to consider whether you're happy to sacrifice a little bit of image quality for a larger screen size when buying the Sony. The simple white and silver chassis design is attractive, yet some might be put off by the glittery effect on the palmrest. The keyboard is excellent, fending off stiff competition from the Apple MacBook. It's the crisp typing action that impresses most, while the keys also travel a very pleasing distance. The inclusion of a dedicated numeric keypad is a welcome addition as well. The latest in networking technologies are present, as are four USB ports for attaching peripherals, and both HDMI and VGA connections, for hooking up to analogue and digital external monitors. We're very impressed by the VAIO VPC-EC2SOE/WI. It offers great everyday performance, excellent usability and a healthy features list. A more powerful graphics card would have made this an unstoppable force, but that might not unduly bother many potential buyers.